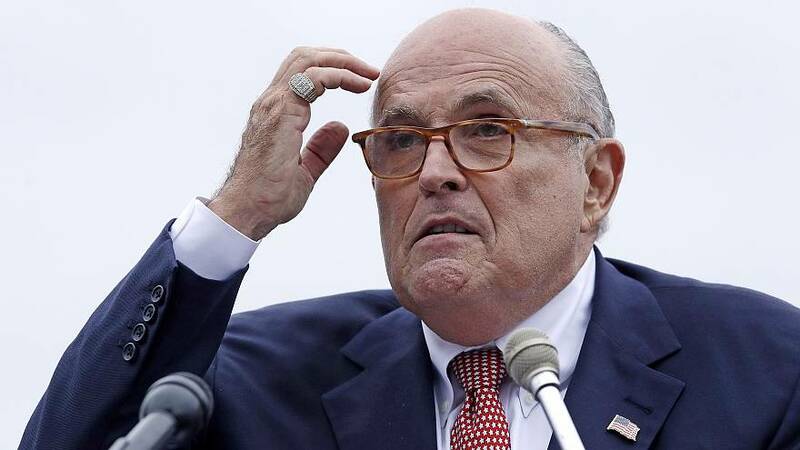 Rudy Giuliani, President Donald Trump's personal attorney, claimed during a Wednesday night CNN interview that he "never said" the Trump campaign didn't collude with Russia. That comment runs counter to his and Trump's past remarks on the matter. Trump has repeatedly asserted that his campaign did not collude with Russian officials. The issue of whether the Trump campaign colluded with Russia is the issue at the heart of special counsel Robert Mueller's investigation into Russian interference in the 2016 election. "I never said there was no collusion between the campaign or between people in the campaign," Giuliani told CNN's Chris Cuomo, who immediately pushed back on that point. "I have not," Giuliani said in doubling-down on his first remark. "I said the president of the United States. There is not a single bit of evidence the president of the United States committed the only crime you could commit here, conspired with the Russians to hack the DNC." When Cuomo pushed back on that line as well, Giuliani said Trump "didn't collude with Russia either!" The president's attorney has previously claimed "no collusion," but that "collusion is not a crime." Giuliani has also said no one in "the upper levels of the Trump campaign" colluded with Russia, adding in a Fox News interview that he had "no reason to believe anybody else did" either. His latest comments sounded much different than Trump's, who has denied that any collusion between his campaign and Russia took place. "There was nobody to collude with," Trump said at a press conference alongside Vladimir Putin last summer. "There was no collusion with the campaign." In a tweet from last February, Trump said his campaign "did nothing wrong — no collusion!" And prior to his former national security adviser Michael Flynn's sentencing hearing last month, Trump tweeted that it was going to be "interesting to see what he has to say, despite tremendous pressure being put on him, about Russian Collusion in our great and, obviously, highly successful political campaign." Giuliani was also pressed on the new revelations regarding former Trump campaign chairman Paul Manafort, whose attorneys appeared to accidentally reveal information in what was supposed to be a redacted court filing that showed Manafort shared Trump campaign polling data with a Russian linked to the nation's intelligence services. "It's not collusion," Giuliani claimed. "Because polling data is given to everybody." The attorney added that Manafort "shouldn't have given it to them" and that it was "wrong to give it to them," however. But he also said such internal polling data "is cooked" and "the most inaccurate stuff."